Oftentimes, it is too easy to become focused on our weaknesses and forget our strengths. 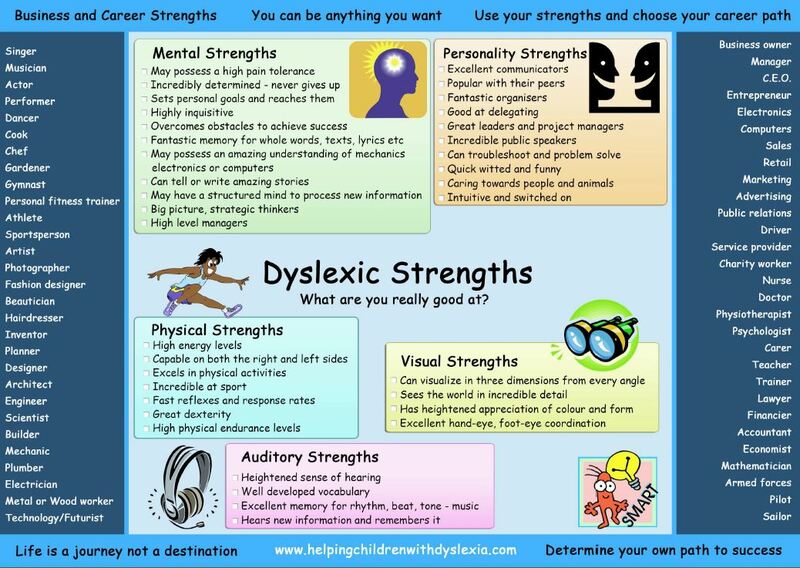 In her book Overcoming Dyslexia, Dr. Sally Shaywitz discusses the "sea of strengths" model. She emphasizes the importance of focusing on strengths as well as weaknesses. "The goal is to make sure that the strengths and not the weaknesses define the child's life" (pg. 93). Shaywitz, S. (2003). Overcoming dyslexia. New York, NY: Vintage Books. Ben Foss also discusses helping individuals discover their strengths and has developed a helpful tool for assisting with this goal. You can find this information in his book The Dyslexia Empowerment Plan: A Blueprint for Renewing Your Child's Confidence and Love of Learning. There are many different MI assessments. Listed below are a couple of examples. As we work with our children to develop their areas of weakness, let us not forget to help them discover and develop their strengths.